Happy Friday! Given it being the first day of September and Pumpkin Spice everything will be overflowing on all the shelves... I thought a little fall inspired outfit was fitting. Even with the temperature in the low hundreds in AZ. My sweet friend, Cheyanne, just launched a new boutique called Ravel. It's filled with classics you can pair with basics and interchange. 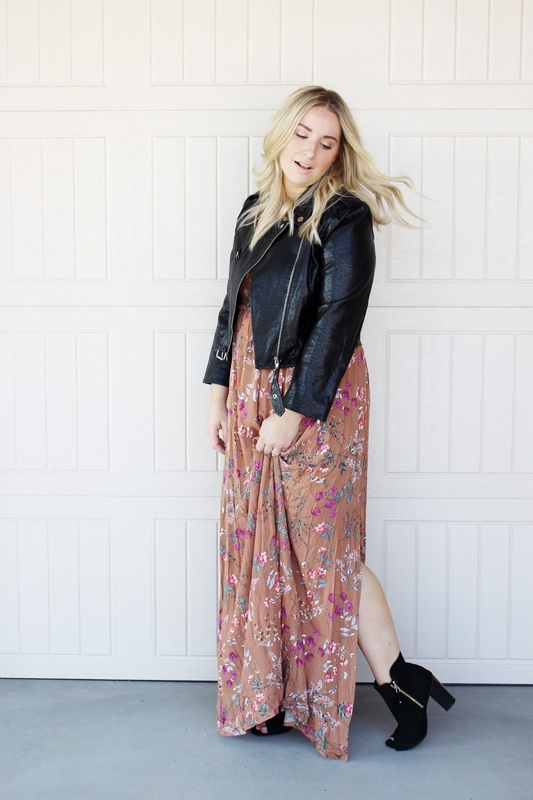 Both this dress and jacket are from there and I know this combo will be on a heavy rotation. This jacket alone I'm already planning to pair with leggings, a white tee, sneaks and a top knot. Perfect momiform for running errands in cooler weather. Check out Ravel Boutique yourself! We're busy this weekend with some projects around the house, one of which I will be sharing a blog post on and can't wait! We're also hitting the pool and BBQing on Monday for the holiday.